Three giant turtle adventures for one great price at Amazon! 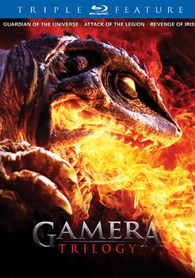 Amazon is offering 'The Gamera Trilogy' available on September 27 for $12.99 (48% off suggested list price). Join Dr. Nagamine, Inspector Osako and the lovely Asagi Kusanagi as they attempt to unravel the mysterious and deadly monster attacks of both the Gyaos and the Legion. With the "help" of the military, the survival of the human race depends on them. And the fate of the world depends on a gargantuan, aeronautic and flamably breathed reptile - Gamera, the guardian of the universe! This limited edition box set includes 'Gamera: Guardian of the Universe,' 'Gamera 2: Attack of the Legions' and 'Gamera 3: Revenge of Iris,' all beautifully remastered in stunning high definition. Click here if you have Japanese movie monster mania!